The startups scene in the Arab world is evolving, as the time moves on we see more startups who are successful and have the right businesses model. DarebniTV is one of them, the Jordanian startup is provides Arabic vocational training for anyone thus helping the users find a job. DarebniTV is helping solve the unemployment problem in the Arab world, by helping people learn and acquire the right skills to find jobs. The startups started the business in 2011 the portal was launched in mid 2012.
between 2011-212 the main work was building the content and the platform. In less than a year of being operational the company made 1 million in revenues. “We expect to reach $10 million per year. Vocational training is a big solutions for the unemployment problem.” Said Marwan Ziadat CEO of DarebniTV. “It is not about the revenues it is about the results., Entrepreneurs some of them open their companies for the reason of being rich and others who are trying to make a huge change, money comes (later) if I make a huge impact money comes.” said Ziadat. First as we mentioned the company is solving a problem, people want to find jobs, but they need skills, the portal offers people the training programs that help them gain those skills. How did they reach customers? Unlike most online businesses who rely on digital marketing to acquire customers DarebniTV has delayed until recently on offline model to acquire customers. “Our business model is unique we do B2C and (B2B) business we created scratch cards and we build up ambassadress program for university students promoting and selling DarebniTV subscriptions to their colleagues . We offer them a sales kit (which includes) iPad 3g free subscription on DarebniTV and a mobile and a commission for the sales they do.” Ziadat told ArabCrunch. In terms of B2B the company assigned distributors for ( the portal) in several countries there responsibility is to assign resellers and ambassadors in the countries they are located at. “And manage the country they have a target of sales (they have to reach). They sell subscriptions and corporate.” said Ziadat. Distributors for DarebniTV are located in Saudi Arabia, UAE, Jordan, Libya , Egypt. There is also group subscription for B2B colleges companies DarebniTV signed strategic agreements partnered with universities in Jordan to have DarebniTV part of their curriculum, on the labs and those universities are: Al Zaraqa university, Princes Sumaya university. Isra university, Amman Ahlia university and princes Basama for youth “very soon we are finalizing (deals) with a new university.” said Ziadat. “I am testing my assumptions and business model in Jordan and see what works to move it to other countries.” added Ziadat. Part of our revenues stream is customized training content for enterprises “we just signed a very deal with Abdel Latif Jameel group in Saudi Arabia” said Ziadat. The group has tens of thousands of employees. The offering is customized training content for the groups employees on vocational topics. DarebniTV currently includes 300 program, 700 lessons and 8 courses, in many categories from computer illiteracy to photoshop and indesign “We are going to add more skills , project management …. Etc. with more time we will have more content.” Said Ziadat. The company Just started with digital marketing around a week ago with ad and social engagement plans on facebook, youtube, adwords ( display and keywords), and enchaining theSEO. 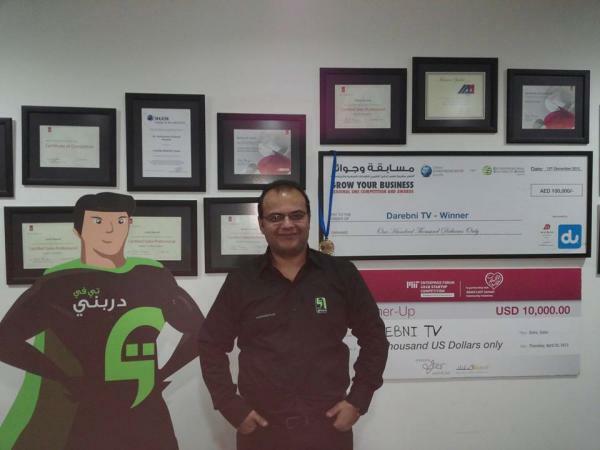 DarebniTV is self funded by Ziadat and has won the second place in MIT Enterprise Forum pan Arab startup competition and best Middle East Startup in Entrepreneurship Summit in Dubai last year.